Your child may qualify for free or low cost vaccines through the Minnesota Vaccines for Children program. Parents with young children have many things happening in their life. They want to do what is best for their child and make sure they stay healthy. However, sometimes that can be difficult. For example, we hear about situations like this often. A mother of a 2-month-old child has a checkup scheduled with the doctor before her child starts child care. At this appointment, the doctor mentions the recommended vaccines her child should get. She knows that getting her child vaccinated is an important thing to do to protect them from dangerous diseases, but she does not have medical insurance. Vaccines can be expensive, so the mother is worried she will not be able to afford them. She asks her child’s doctor if there is anything she can do. The doctor tells her about the Minnesota Vaccines for Children program. 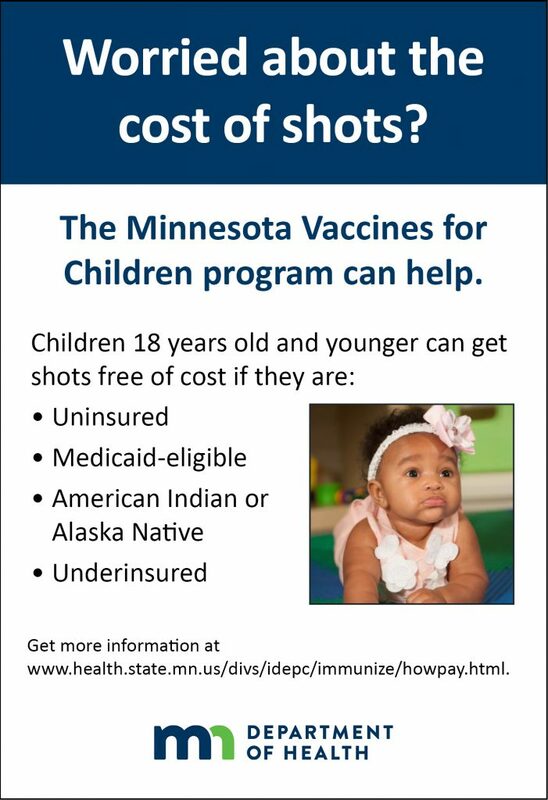 Through the Minnesota Vaccines for Children program, children 18 years old and younger who do not have medical insurance, are enrolled in Medicaid, are Native American or Alaska Native, or whose insurance doesn’t cover the cost of the vaccine can receive all recommended vaccines free of cost. The Minnesota Vaccines for Children program helps make sure children can get all recommended vaccines at the right time by not letting the cost of vaccines stop a parent from vaccinating. Delaying or skipping vaccines can put children at risk for diseases that can cause serious health problems. Children who are behind on their shots can get caught up, but it is best to get vaccines at the recommended age to help protect the child when they need it most. By age 2, children can be protected from 14 diseases if they get all of the recommended vaccines. Getting vaccinated protects your child and others in the community so disease does not spread. Vaccinating your child is one of the most loving things you can do. Diseases that used to be common in the United States are rarely seen. That is because vaccines work and vaccines are safe. Almost all clinics that see children in Minnesota participate in the Minnesota Vaccines for Children program. Ask your clinic if they participate in the Minnesota Vaccines for Children program and if your child can get vaccines free of cost. There are other fees you may still have to pay when you go to the doctor for the vaccines. You can call your clinic to ask if there are other fees before your visit. Find out if your child is eligible to get free or low cost shots by talking to your clinic or going to this website: www.health.state.mn.us/divs/idepc/immunize/howpay.html. If you are looking for more information about vaccines and the diseases they prevent, look at the Vaccine Information Sheets on this website: www.immunize.org/VIS. They are available in many languages.